In a cartoon of 1795 the satirist James Gillray conjures a striking landscape. In one corner of his engraving, London landmarks – The Monument, the dome of St Paul’s Cathedral – collapse amidst leaping flames. In the foreground an ecstatic figure, ‘The Prophet of the Hebrews’, leads a large procession of dour, elect citizens over the trampled forms of bishops, kings and demons, towards a portal. The opening is labelled “Gate of JERUSALEM’ and is ominously decorated with nooses. The subject of this satirical portrait is Newfoundland-born Richard Brothers, a midshipman and naval officer who resigned from the military to preach against war, hail the restoration of the Jews to their ‘Promised Land’ and summon a renewed Jerusalem. His take on Jewish apocalyptic literature and his abrupt pacifism brought his prophetic ministry into conflict with ‘sinful London’ and the government led by Pitt the Younger. 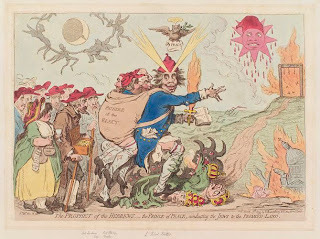 Gillray’s cartoon appeared on the occasion of Brothers’s arrest for Treason, which precipitated him into Fisher House, an Islington asylum. During the 11 years of his incarceration, Brothers produced detailed plans for his renewal of Jerusalem. These plans have been preserved by what little remains of Brothers’s once considerable millennial movement: today called The Panacea Society. In a book of scrupulous detail and engaging narrative – The Paddington Prophet: Richard Brothers’s Journey To Jerusalem - as attractive and accessible to general as to specialist readers, Deborah Madden, a Postdoctoral Research Fellow at the University of Oxford’s theological Faculty, has contextualised Brothers’s spiritual-utopian plans in romantic culture and outsider theology. The key category for Madden is ‘imagination’ and she subjects Brothers’s millennial and architectural imagination to a scarifying examination; she refuses to be ‘embarrassed’ by his apparent marginality, but at the same time resists any temptation to romanticise Brothers as a wayward genius or prophet ‘out of his time’. Instead she locates a spatial imagination in politics, in texts, in naval culture, in isolation and incarceration. Brothers is an imaginer of a very complex space. He is only in parts a tipper-over of apple carts, disrupting the orthodoxies of various “chosen peoples” (in itself not without a reactionary potential), and turns to a passive conservatism when confronted with the consequences of at least seeming to advocate king-killing. 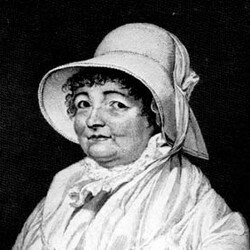 This turn is characteristic of an imaginary rather than a practical millenarianism; when challenged by the Exeter prophetess Joanna Southcott, he resorts to imitating her, negating the individuality of his own vision. This might seem like a kind of slipperiness, but is consistent with his ‘authorised’ imagination. For Brothers’s beliefs are reactive; he receives special revelations directly, and their authority is what he must serve. Despite the apparent marginality and extremeness of his vision, there is a kind of formalism to it. Like Southcott, his appeal is to an external authority (not to any internal genius), his potential rebelliousness lies in the question of what authority he might choose. When prophetic, absent, dislocated authorities push Southcott and Brothers into conflicts with earthly authorities (of church and state) both negotiate accommodations of a kind. United by their opposition to modernity, but inspired by crisis (the revolution in France is a vital presence for both), Southcott and Brothers are divided by their contradictory attitudes to religious and political establishments. 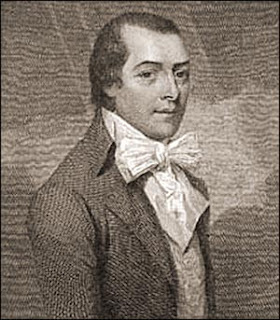 For all her troubles with the Church of England, Southcott always hoped for their license and approval, while Brothers broke his links with the major religious institutions early on in his prophetic career. In regard to the political establishment, Brothers eventually chose loyalty to the throne, while Southcott went on embroidering a rug to conjure the death of the monarch on a set date. Their authority-centred resistance required of each of them a compromise with some part of the establishment. Brothers was clearly feared by the authorities, who associated his prophesy with more democratic and radical forms of resistance, but in practice his language and imagination were often of colonial aspiration and an exotic objectification of the geographical ‘other’. His attitudes to ideal social organisation were authoritarian and autocratic. He was to be Prince of his New Jerusalem and his robes were designed. Locked away in Fisher House, and removed from any influence that the politics of the streets and the meeting rooms might have had upon him, Brothers had the time to ‘realise’ his prophetic imagination in obsessively detailed plans for his rebuilt ‘Jerusalem’. What is beguiling about Brothers’s architecture is the way that, despite being isolated from the ‘outside’, despite his obsessive mining of biblical texts for direction and calculation, and despite his appropriation of another history (the Jews in Israel) and of another place (the Temple in Jerusalem), what he ends up with is something rather close to architectural modernism and orderly town planning; an idealised social functionalism. There is nothing very romantic or ecstatic about his designs; nothing of the idealism of, say, a William Morris or a Constant. This is a utopia of authority and hierarchy. However, the contradictions in Brothers’s architecture are not exclusive to him. Madden is very strong on this: Brothers was designing real architecture, to be constructed in the “actual visible existence” of the world. His compromise with the political authorities may have been partly an act of self-preservation, but it also contained the hope that these powers might facilitate the building of his plans, and so they are inflected with the same kinds of accommodations and practicalities as any urban plan. And in a way they were built, though not directly. For all the planned cities – of Wren and Evelyn in London, L’Enfant in Washington, Lutyens in New Delhi, the Griffins in Canberra, Le Corbusier in Chandigarh, Abercrombie in London and Plymouth (some realised, some adapted or ignored) – are works of obsessive repression of desire and control of the everyday, often containing some crypto-spiritual agenda (Feng Shui, Kabbalah) not because they were intended as magical or ritual structures, but because such grand design is necessarily ideological; they require some guiding, but flexible (spiritual) idea. Pure functionalism as realised by Le Corbusier is rare, a directly and militantly political architecture, like Haussmann’s Paris; a spiritless authority. More prevalent, and in the Brothers tradition, is the idealism of the all-seeing eye in the planners office, above the draughtsboard or model, (in Michel de Certeau’s example, on top of the World Trade Centre), dreaming the shape of “City”, not to be lived in, but, first and foremost, to be pleasing to Style, Master, Theory. In such a spiritual architecture humans become models, human will is absented or diluted in the presence of a greater, modelling, Will. Inhabitants are imagined as the comic-generic figures of ‘artists’ impressions’; clean beings without experience or subjectivity, rationally accommodated in their clone-like happiness-bubbles. These ciphers move airily, Prozacked, along wide boulevards, dwarfed by all around them, shrunken, too small to find a purchase upon anything, sliding down the vistas. The spills and textures of singular beings have been wiped away. Hygienic, uncluttered, lacking detail, the buildings are like photo-fit pictures of white collar criminals. Brothers’ grid is like this, only for the neo-classical ornamentation of his gargantuan palaces to disrupt its elegance. Where the architect Jan Gehl prioritised the humanisation of the space between buildings, designing spaces of drama and interaction, flirtation and voyeurism, the spiritual architects have idealised this space into “non-place”, characterless and intellectual, rational and logical, places of unimpeded flow, rather than pleasurable frictions. Brothers is clearly fascinated by such a non-human space. There is very little sense of human behaviour in the drawings for his projects. Some seem like illustrations for Edwin A. Abbott’s ‘Flatland’ fantasy. Behaviour is an inconvenience, dealt with in a gloss. Relegated to the hinterland. For there is a hinterland to Brothers’s heaven on earth; an intriguingly political incompleteness to his vision. It is a true utopia, in that it defines itself by what and who it excludes, but its walls are porous to some degree, acknowledging the mucky business of business, the need for the holy city to sustain itself (perhaps memories of the harvest failures of 1784 and 1785 remained on Brothers’ mind). This may have more to do with the charms, ambiguities, absences and constraints of architectural design, than any real intention on Brothers’s part. His written description of the Temple of Solomon emphasises simple materials and ‘primitivist’ elements in an imagery that is sometimes at odds with his own designs, as well as with its regularity. Such ambiguities are possibly accidental and subjective to Brothers, or perhaps symptomatic of Brothers’s confusion about a pre-Diaspora Jewish culture which he regarded as superior to anything before or since, and yet felt driven to architectural models that are neo-classical, mostly Corinthian, occasionally Ionic. Such borrowings were made problematic by their association with historic Rome, a model for a corrupt contemporary London, and yet Brothers still borrows them – in order to make a practical city. So, there is accommodation to a physical being, but not to any singular or individuated presence. When we look at the plans we see only the future, they have no present. He designs gardens, perhaps in reaction to his incarceration, that are essentially places to be escaped to, but not into, not places to be in; there is no content to them, only places to get to, places of aspiration and destination rather than habitation. There is no “here” where the saint can be present, there is only an everlasting route through the symmetry to a ‘better place’. The situationist and COBRA architect Constant attempted something similar in his plans for a New Babylon; an abstract idea of human mobility realised by demoting dwellings and promoting an endless ambulatory dérive borrowed from the pages of Gilles Ivain’s Formulary For A New Urbanism. He mapped a never-ending aspiration to get nowhere in particular, an idea of the dérive as an endlessness-in-itself rather than a practice for the making of future situations. Like Brothers’, Constant’s model was realised: in a car dominated urban landscape, in which the means of transport have overwhelmed arrival and habitation, in which the car becomes a kind of living room (stereo, video, coffee, etc.). Capitalism requires these spiritual renewals. Just as aesthetic modernism needed Theosophy. Just as the worldwide crash requires an ‘Atlas Shrugged’ movie. So city planning requires New Jerusalems or ancient beliefs for its Pudongs. But what if there is another kind of ‘imagination’? The “imagination” that Mythogeography owes so much to is the neo-romantic tradition of imagination – of Paul Nash, Arthur Machen, Powell and Pressburger, Barbara Jones, Alan Moore, etc. These are often, but not always spiritual imaginations, but they are also imaginations of exploration, their magick, their gnosis, their uncanny are always slipping out of their frames; their works are experimental arts. And they expect (and demand) their audiences to be equally testing; the neo-romantic audience must try out various ways of watching, shifting how it identifies different elements within the timespan of an artwork. This does not imply an indifference to form; or an idealist return to individual genius or decontextualised originality. What mythogeography values about imagination is not the idea of a ‘poetic truth without poetic form’, but rather the interplay of imagination with the overwhelming of form, the painting that oozes out of the frame; play, in other words, but with a concern for places that are magical, multi-dimensional and infected, that are psycho-geographical (not space as psyche, but psyche extending into space). So, for the mythogeographer, the plans of Brothers (et al.) can be enjoyed as ‘fantasy psychogeographies’, the formal and ideal layers of a psycho-geographical and multi-dimensional ‘playing field’, to be carried about by the dériviste as a comical-mental map, to be enjoyed for the tensions it generates with the congestion and organic stickiness of actual pedestrianism. But once the ideal, the utopian, or the question of “truth” arises, then this mythogeographical imagination is halted, trapped in an either/or binary, between ideal and function. For mythogeography is not concerned by the issue of one over the other – aesthetics over commerce – but, by refusing to operate in such terms, it seeks no synthesis. Indeed it defers it. The ‘ideal’ spaces of mythogeography are generally small, limited, provisional, sometimes confined to an ironical detail, sometimes rolled out in wasteland, or curled into a web of backstreets. Here the spiritual architectures can be fictionalised, and small pieces torn off into reality, like the corners of a gingerbread hornbook. Freed from their own “truth”, ideal worlds such as Brothers’s become spaces for contemplation, for a new imagining, a ne-Platonic plane for making connections across abstracted terrain, and from which (in some asymmetrical relationship) material incarnations or proposals can drop down in fragments, not in boundedness. The lessons of the radical medieval and renaissance utopias that are described in Norman Cohn’s Pursuit of the Millennium are far from those of imagination; they are social ones. They are about the problems of ordering people according to good and evil, chosen and damned, with a ubiquitous anti-semitism operating as a short cut to an off-the-peg enemy. In actuality (where dreamers had the misfortunate to realise them), these ‘visions’ were enforced with the rapid self-ascension of prophet to messiah, and the promotion of liberated peasant to executioner. Brothers’ vision however is not of a primitive communism (then distorted, enforced and bounded), but of a benevolent autocracy, (that is surprisingly leaky) – his study of the scriptures has given him a huge temporal canvas on which even his visions are just a ‘passing phase’. Like the time scale of Gnosticism, he is caught in a narrative of aeons; there is neither temporal nor geographical finality to his utopia, he imagines its trade with other places. What Brothers’s leaky vision offers to mythogeography is the fantasy of beginning again, not from scratch, but from the ruins of a crisis-torn and ecologically devastated capital and its surviving strands of connection and trajectory. This is the cataclysmic opportunity; of New Orleans after Katrina or Lisboa in 1755, or of parts of Japan today, of the rebuilding of European and Japanese cities after the Second World War; the sweeping away, briefly, of the burden of history. What is then the test (just as it is for costume design and sci fi movies) is how far there is a beginning rather than a repetition of an imaginary (all those eighteenth century European city centres built in the 1950s, all those 1960s futuristic movies with characters dressed from Carnaby Street). So, it is not anything that Brothers produces, neither a plan for a real city in “actual visible existence” nor an ideal and fictional world, but rather it is the manner in which different layers of ideal, plan, authority, reference, materials, models and traditions are all operating at once and without anything more than a formal integration. It is in their resistance to clarity and yet their non-rejection of practicality, that the Brothers plans for ‘New London’ are simultaneously real, but un-sited places and an ‘art of memory’, a symbolic landscape for placing fragments of other ambiguities and contradictions. These are not plans that should be (or should ever have been) made, but they can be re-thought as a guide to a resistant geographical imagination.